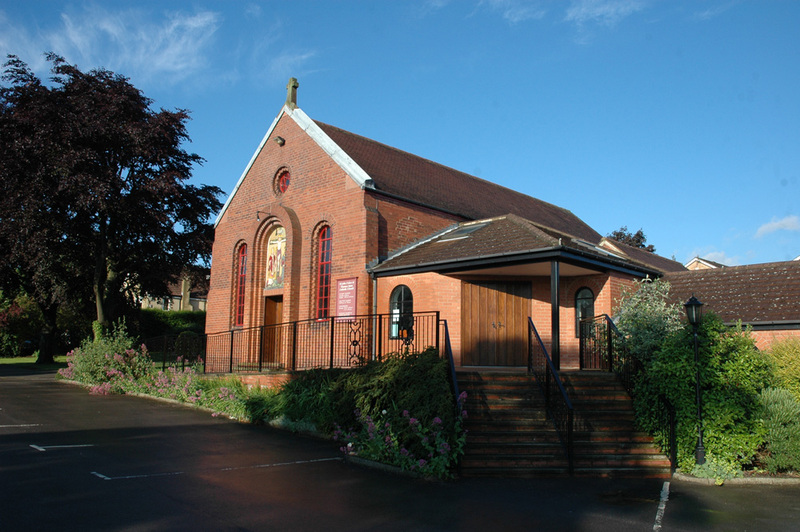 St John Fisher & St Thomas More Catholic Church is situated between the villages of Burley in Wharfedale and Menston, our address is Bradford Road, Burley-in-Wharfedale, LS29 7PX. 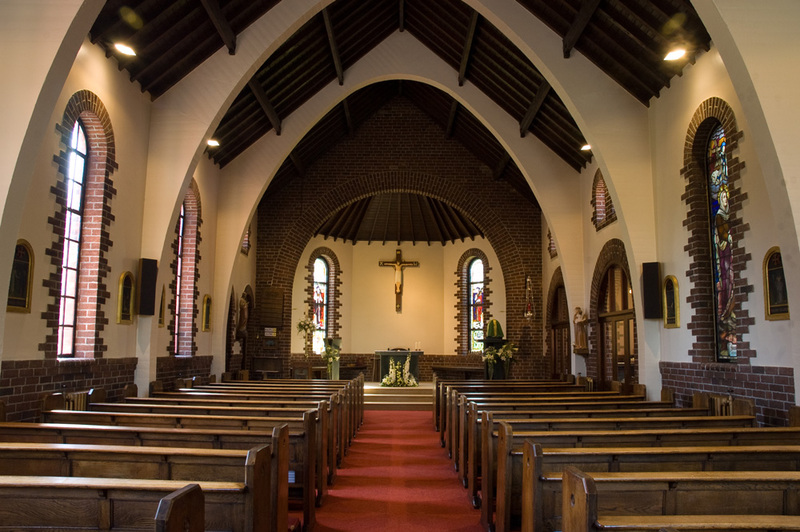 Our friendly parish would very much like to welcome you to our church throughout the year. 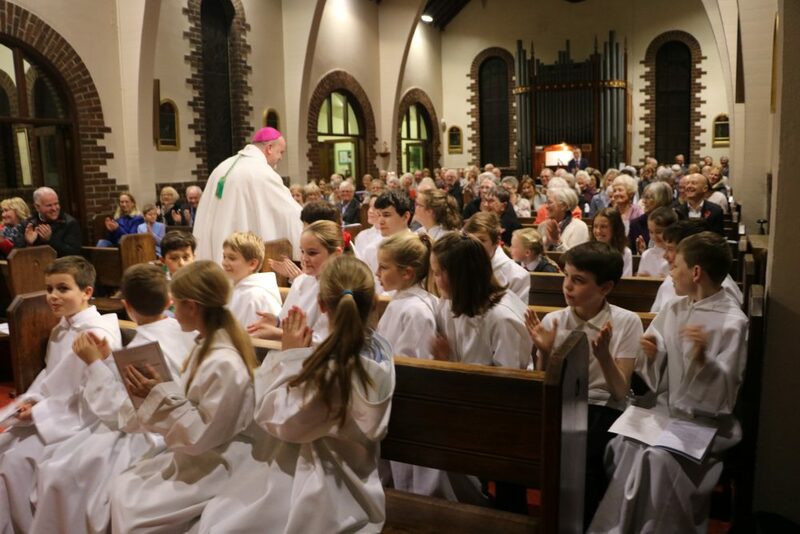 You can find details of our parish life, how you can get involved and who to contact for further information, in our welcome pack that can be found here. Hard copies of the welcome pack are available in the church foyer. 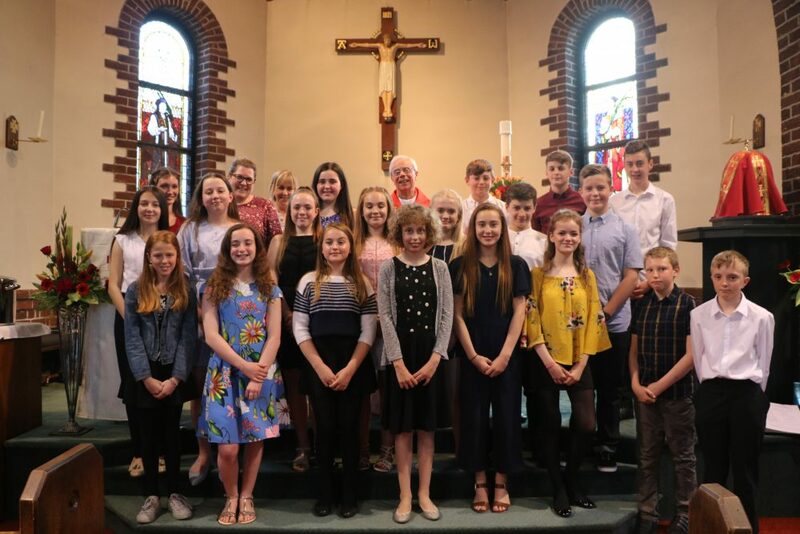 If you think you would like to help in any role, please feel free to ask Fr Michael to pass your details to the organiser of your chosen ministries. 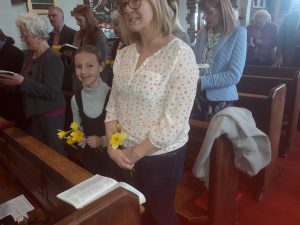 Children of the Parish Family presented all the ladies with daffodils galore. 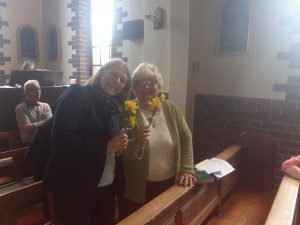 Thank you to this year’s Flower Fairy Godmother Pat for preparing all the lovely daffodils! 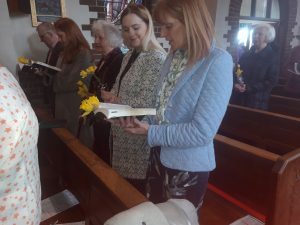 A huge thank you goes to Parish Family of SS John Fisher and Thomas More Parish, Burley-in-Wharfedale; who had the novel idea of filling used handbags with toiletries, ladies products and men’s personal hygiene and shaving necessities for those in need. Six bags have been given to Sheila Pickles from St Monica’s Housing to give to the destitute asylum seeking women in the House in Beeston, four bags have been retained for the new house in Harehills for the destitute asylum seeking women who will be housed there. Carol Hill (Director of Catholic Care) made the final delivery of the remaining bags to St George’s Crypt to support homeless men and women. 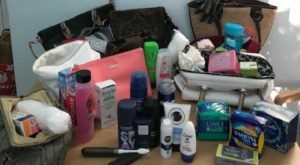 Martin Patterson (Development Director at St George’s Crypt) said people often forget about specific ladies toiletries and the bags were very welcome. He thanked those who had donated. 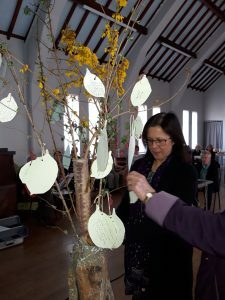 We finished with discussions about personal and parish actions that we can do, committing these to paper in the shape of a leaf for our future use. On 28th February 2019 26 year 6 & year 7 students received the Sacrament of Confirmation from Canon Michael. Our Catechists Rachel and Liz thoroughly enjoyed the preparation sessions. It was wonderful to hear Saint John Paul being chosen as her Confirmation name by one of the students. Laughter was the keynote of each session as it was at the gathering in the parish hall after the celebration of the sacrament. 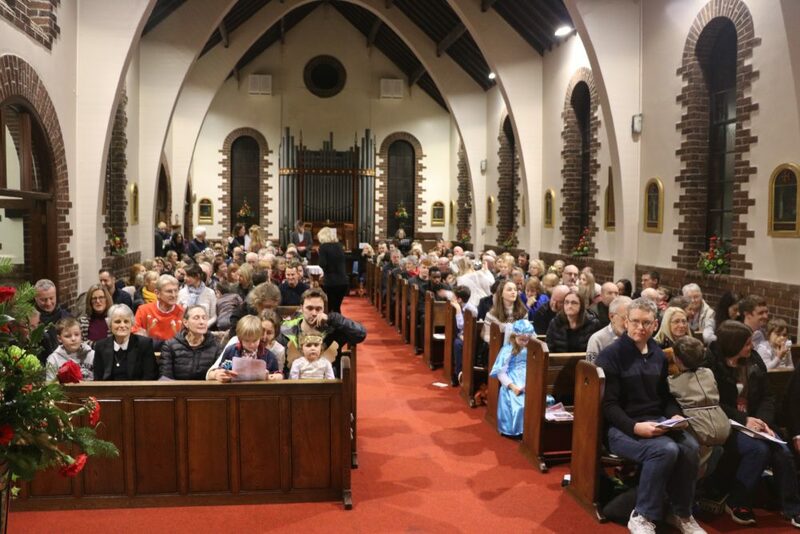 Both church and hall were filled to overflowing as the parish family gathered with Father Michael to share a party supper! 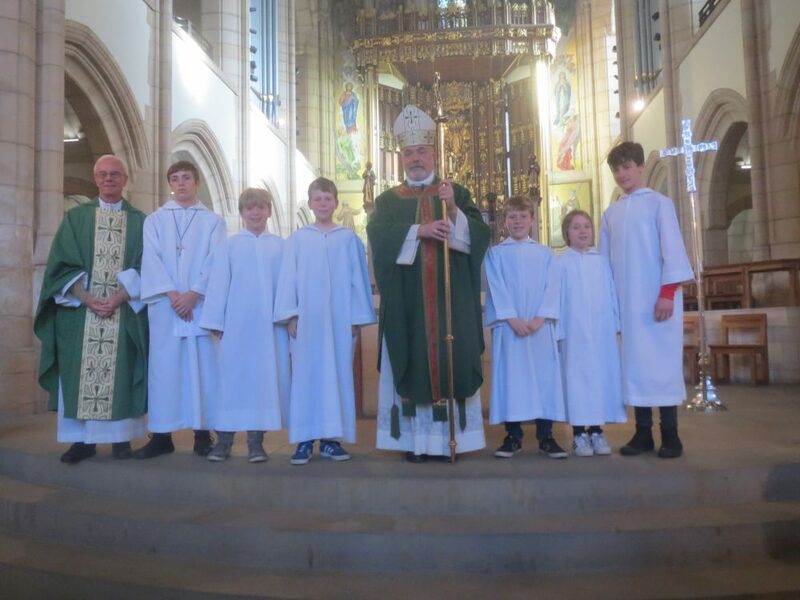 Eleven younger members of the Parish Family made their First Confession on Saturday 23rd March. Canon Michael thought them the best group ever! 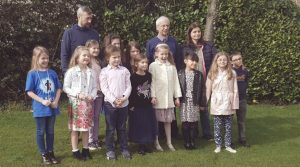 The children told their Catechist James, helped by Gabby and other parents, they had had a lot of fun in their preparation sessions. 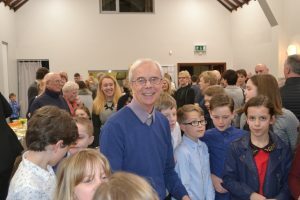 After receiving the Sacrament the celebrations continued in the Parish Hall with a party for children and families – as the photos show Father got lots of help when cutting the scrumptious cakes! Bishop Marcus has asked us to support our diocesan charity Catholic Care. 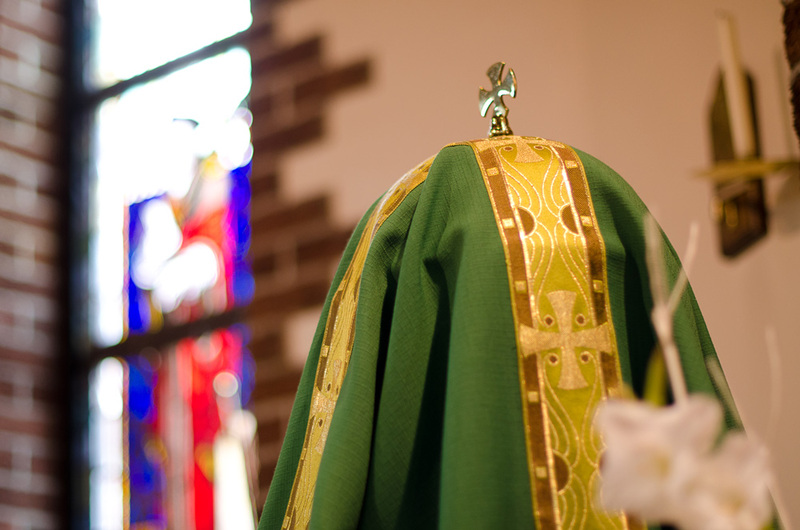 You can read Bishop Marcus’ letter here. 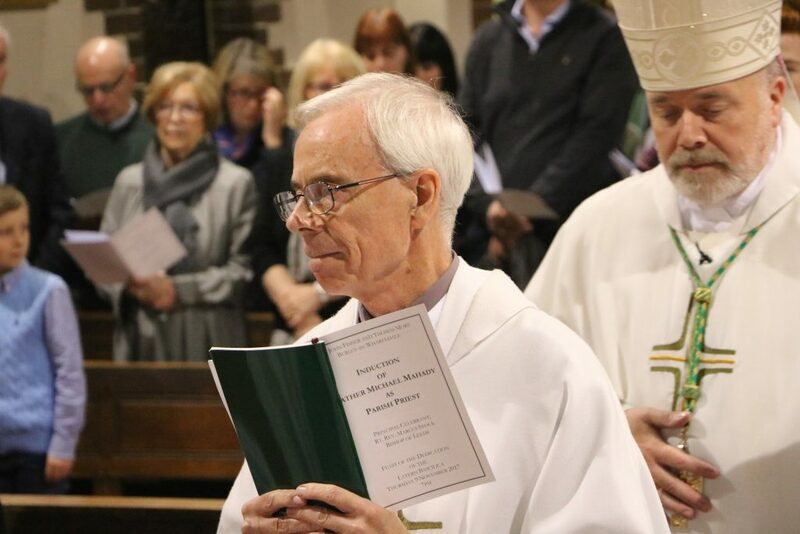 Bishop Marcus has responded in his capacity as Bishop of Leeds to the publication on 20th August 2018 of the Holy Father’s Letter to the People of God on the need for ‘…combatting all forms of the abuse of power, sexual abuse and the abuse of conscience’. You can read Pope Francis’ letter here and Bishop Marcus’ letter here. Catholic Care Catholic Care is one of the charities we support. A link to a short video describing its work can be found here and further information is given on our charities webpage. Please see news here of Traidcraft’s trading position from Robin Roth (CE0), with hopeful news of plans to slim down and keep trading in 2019. * More and urgent action is needed about Climate Change. * An Inter-generational Conversation about Climate Change at St Mary’s school Menston. 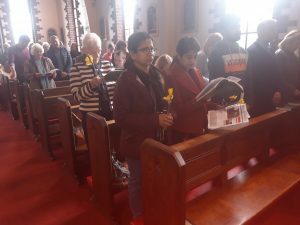 * Updates from the recent Diocesan Refugee Support Group meeting in Bradford. plus our usual events summary and reflection. Kim wrote this poem just after David’s funeral. He was Kim’s brother’s eldest son. He was a corporal in the Royal Marines. He was killed while on active service in Afghanistan on 24 October 2012. He was 27 years old. Our parish has supported CAFOD’s work with the Puentecitos community in El Salvador for the last 3 years. We raised £491 from book sales in the church foyer and £2,511 from our parish team running the 2015 Great North Run. Read here about the amazing projects that have been completed, helping to improve people’s income and food production in this very poor region of the country. From January 2019 our parish has been supporting people in Magdalena Medio, Columbia through CAFOD’s HandsOn programme. Minutes from the October 2018 meeting can be found here. You can find out more about the work and the history of the Knights of St Columba (KSC) here. 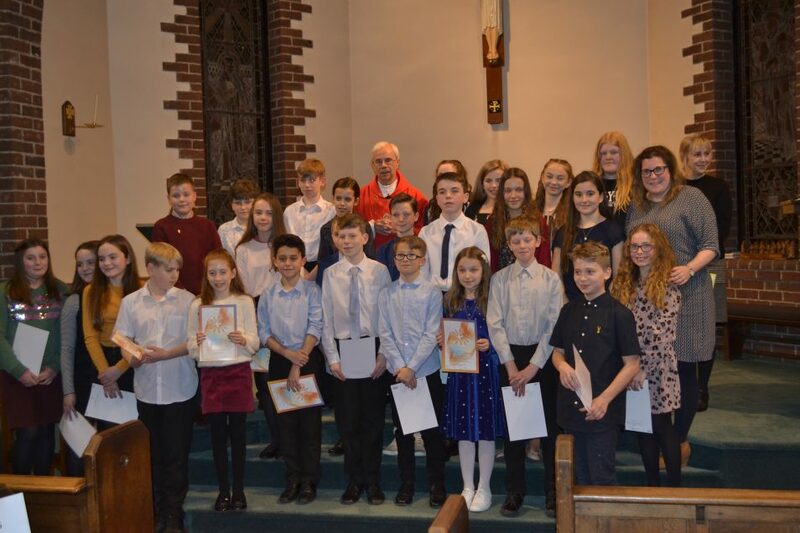 An application form to join our parish KSC can be downloaded here. 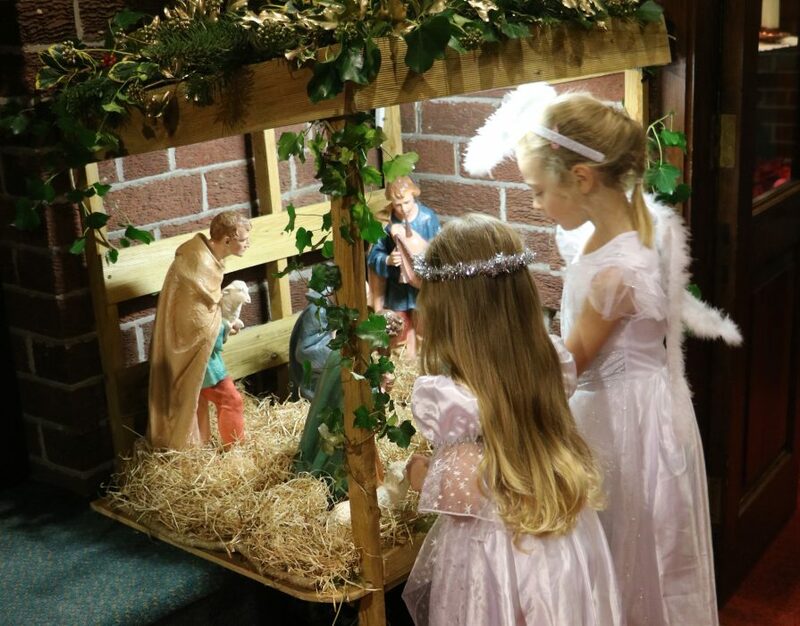 Mass times are 6pm on Saturday and 9am & 11am on Sunday.